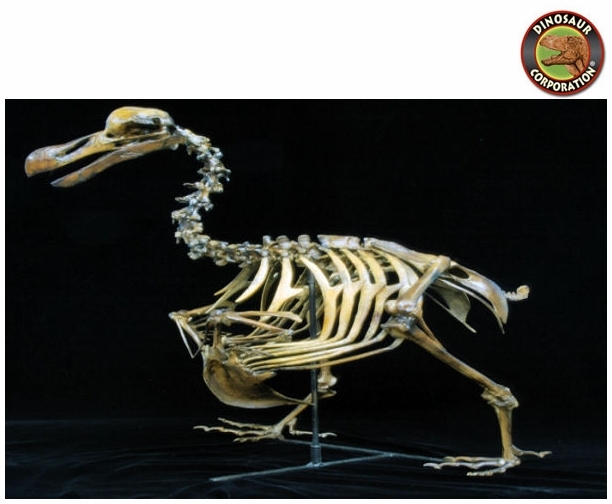 Dodo Bird Skeleton. Mounted. Raphus cuculiatus. Polyurethane cast from a Royal Ontario Museum Specimen. * Size: 27 inch (69cm). The Dodo (Raphus cucullatus) is an extinct flightless bird that was endemic to the island of Mauritius, east of Madagascar in the Indian Ocean. Its closest genetic relative was the also extinct Rodrigues solitaire, the two forming the subfamily Raphinae of the family of pigeons and doves. Dodo birds were very large birds, 1 metre (3.3 feet) tall, and possibly weighing up to 23 kilograms (51 lb). The higher weights have been attributed to birds in captivity; weights in the wild were estimated to have been in the range 10.6�21.1 kg (23�47 lb). A later estimate gives an average weight as low as 10.2 kg (22 lb).